All dog owners have a responsibility to make sure that their canine is in good health through regular walks, plenty of water, nourishing food and check-ins with a veterinarian. One aspect of pet ownership that is equally as important as the aforementioned activities but is often overlooked is dog dental care. An infection in your dog’s teeth can cause serious health problems, in addition to pain and discomfort. For this reason, taking care of your dog’s teeth should be a part of your everyday routine. Providing dog dental care doesn’t have to be hard or expensive. A few simple items can greatly simplify the process, and help your dog maintain dental health throughout his lifetime. This article explores how you can help your dog keep his teeth clean — without losing a finger in the process! One of the easiest ways to help your dog get clean teeth is through toys and treats specifically designed to clean teeth. Chewing on certain treats or toys can scrape away plaque or dirt on your dog’s teeth, making the daily process of cleaning much easier for both you and your dog. Consider giving your dog a rawhide or knucklebone. By chewing on these natural treats, your dog will be helping to maintain his dental health while getting a little something special. One of these items could last for days, making it a fairly cost-effective method to clean teeth. There are also many treats specifically manufactured to help clean your dog’s teeth. While they will not replace regular brushing, it can help reduce plaque build-up and make the brushing process easier. Your dog’s teeth may also benefit from non-edible chew toys. An artificial bone or chew toy — ideally with a rough or bumpy surface — can help get that plaque off of your dog’s teeth. Just be sure that the toy is not too hard and that it is big enough so that it isn’t a choking hazard for your pup. 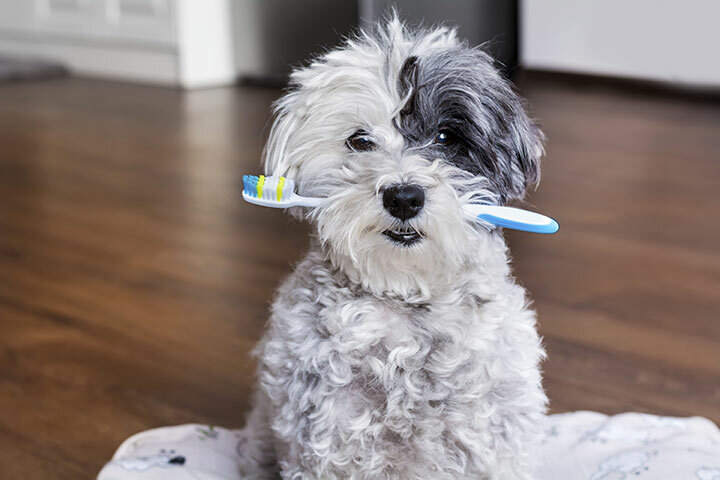 The thought of brushing a dog’s teeth may seem daunting (or even ridiculous) to some people, but the fact is that regular brushing is critical to your dog’s dental and overall health. Learning what you need and how to do it can help make the process easier. First, gather the supplies you will need. Start with a toothbrush just for your dog. You have options for toothbrushes, depending on what works best for both you and your dog. A soft-bristled human toothbrush may be most comfortable for your dog, or she may prefer a toothbrush made specifically for dogs. These slip over your finger and are more angled. They will give you more control over the tooth brushing process, but do require you to put your finger into your dog’s mouth. Next, choose a toothpaste that is safe for you dog to swallow. This means that you cannot use a toothpaste meant for humans, which has ingredients that your dog should not eat. Experiment with flavors, such as beef, chicken or seafood, to find one that your dog prefers. Finally, you should buy some canine dental pads at your vet’s office or pet store. It is a quick solution to wipe away bacteria whenever you don’t have time for a full brushing. You just wrap it around your finger, wipe your dog’s teeth, and go. After you have everything that you need, you can start the task of brushing. This requires getting your dog comfortable with having your fingers in or near his mouth. Take the time to work with your dog on this process. An easy way to do this is by applying a favorite snack (like peanut butter) to your fingers, and let him lick it off your finger. Rub his teeth and gums while doing so that he becomes familiar with the sensation. At the same time that you are doing this, work on opening up your dog’s mouth. Put one hand under his jaw and the other on top, and slowly work towards opening up your dog’s mouth. Doing this gently will get your dog used to the idea of you working in his mouth. Once your dog is ready, get out the toothbrush and paste. Allow your dog to lick and sniff it, and then rub only the visible teeth. Use a circular motion as you slowly increase the number of teeth that you are brushing, focusing on the gum line. After your dog gets used to this, gradually try opening his mouth to brush the back teeth. Give your dog a reward after you are done brushing teeth to create a positive association, and make sure to devote time each day to brushing. Dog dental care does have to be complicated; it can be as simple as providing chewy treats and making time for daily tooth brushing. Committing the time and energy to brushing your dog’s teeth can result in a much healthier and happier dog overall — and a much easier checkup when he sees the vet! If you would like more advice from a pet care professional, or to learn more about dog walking or pet sitting services, contact Paw Pals today!